Sunday, July 3, 2016 / Yaroslavl, Russia — Russian league of american football (LAF) match in Yaroslavl wasn’t a very big event, but it can be pointed out by the important moment in the beginning of the game. 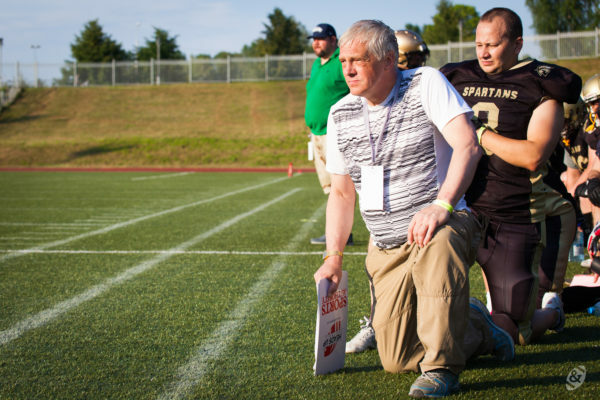 Right before the kick off Spartans took a time out in the memory of legendary Buddy Ryan — former coach of Chicago Bears and the creator of «46», one of the great examples of solid defences in history of american football. It’s hard to imagine, that anyone in Spartans knew Buddy Ryan or even was lucky to watch him on the sideline during the NFL game. Moreover, american football is not a popular thing in Russia, and no one from the audience watching this game on the stadium or broadcast was familiar with his name. However, coach Ryan was the important person for Spartans philosophy and defence principles, and it was enough for them to loose a timeout and pay respects. 6000 miles away, 35 years after 46, in the militant country, a tiny group of athletes remembers who made such of an impact to their favourite game. Spartans overcame Rebels by 32:0 with Denis Krasnov and Andrey Kluzko scoring three rushing touchdowns and Alexander Yatsunenko and Sergey Nikolaev caught 2 passes from Alexey Nikiforov in the endzone.